I have been refused a UK visit visa to take the PLAB 2 exam for the third time and it's so frustrating. Let me briefly explain my case for better understanding. I'm an Afghan refugee residing in Pakistan since 1992 with my family and one of my brothers is in the UK as a British citizen. I completed all my education in Pakistan and now working in a local hospital as a permanent employee. I cleared my IELTS and PLAB 1 in November 2017. 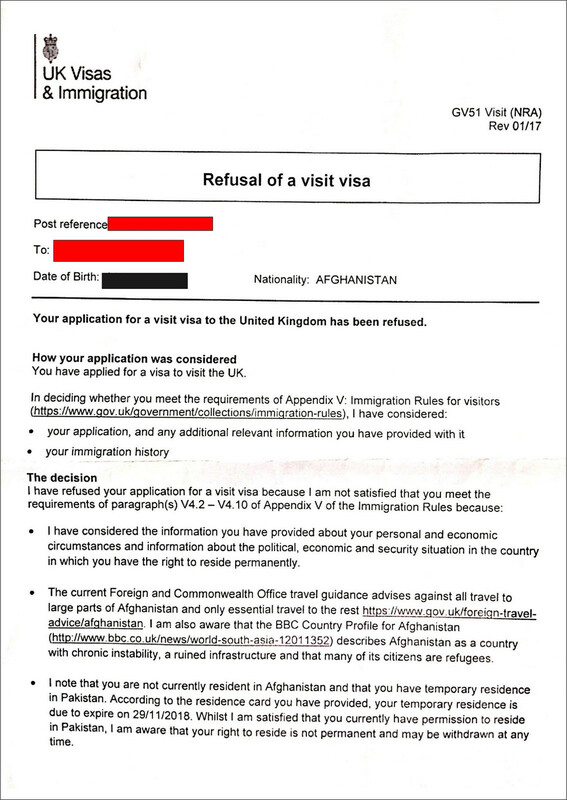 Since then I applied for a UK visit visa for 3 times and was refused. I took help from a visa consultant for the third attempt but without success. I have a refugee card issued by UNHCR and the Pakistani government. I have a visit visa to travel between Afghanistan and Pakistan. In my third refusal letter, the ECO stated that my residence card is due to expire in November 2018 and the 3,500$ deposited once as savings from my 6-month salary is above my income (approximately 500 GBP more). The ECO also said that my family's whereabouts are not available although * provided evidence of my 3 of my 7 siblings' educational documents to show they study and work. Please help and guide me on what I should do. I intend to go to the Maldives and work there for at least 4 months, open a new bank account and reapply for a visa from India. Will this help clarify my situation and change my circumstances? 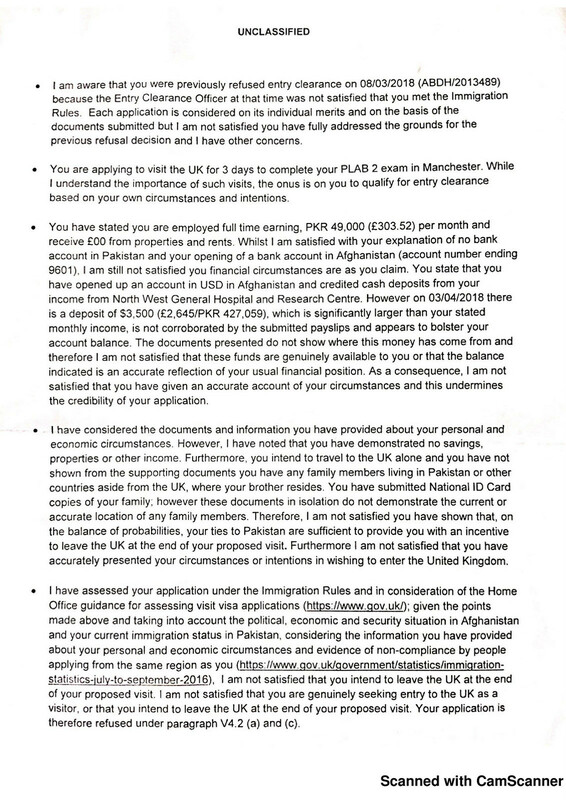 To be approved for a visa, you need to resolve the issues that are shown in the refusal letter. A large deposit was made into your bank account which was not explained. This by itself is sufficient to cause your application to be refused. All deposits into your bank account need to have evidence of their sources included with your supporting documents. Your residence permit expires in a few months. Pakistan might not extend the stay of Afghan refugees again, and the ECO is concerned that you might be looking for a third country to immigrate to. This also is sufficient by itself for a visa refusal. To overcome this you will need to change something about your "personal and economic circumstances in Pakistan" - whether this is making more money, or migrating to a third country, or returning to Afghanistan. The ECO did not consider the documents you submitted regarding your family members sufficient to prove that they are currently living in Pakistan. You should obtain documentation which proves they are currently living and/or working in Pakistan, such as apartment leases, payslips, etc. Not the answer you're looking for? Browse other questions tagged uk visa-refusals standard-visitor-visas refugees or ask your own question.